Mon., March 26, 2012, 12:44 p.m.
BOISE - Idaho lawmakers continued their session-long skirmish with Occupy Boise supporters on Monday, with emergency legislation clearing a House committee to allow new state rule-making regarding the site where the protest is set up across from the state Capitol and making rule violations infractions. HB 693 passed the House State Affairs Committee on a party-line vote with the panel’s minority Democrats opposing it. After the vote, Occupy supporters chanted in unison a message that included this line, “Please join the people later today as we issue an eviction notice to the corrupt members of this legislative body.” Committee Chairman Tom Loertscher, R-Iona, banged his gavel and declared that the loudly protesting group would be removed; two Idaho State Police officers escorted the chanting protesters out. State Department of Administration Director Teresa Luna told the committee that HB 693 would “better define the Capitol Mall properties,” and authorize rule-making about behavior there. 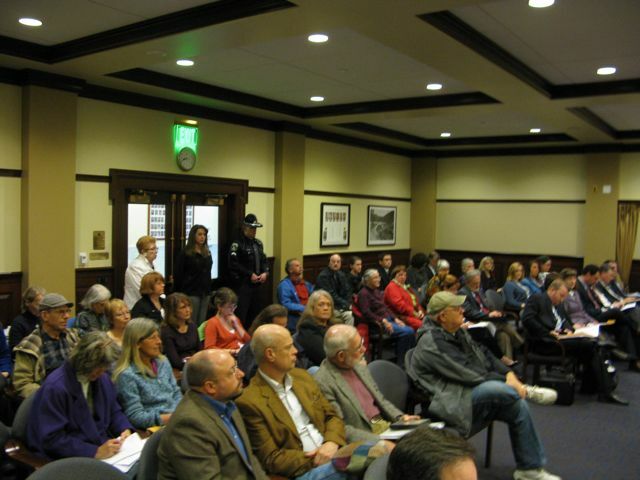 “While the need for this legislation became clear because of the litigation regarding use of the Capitol Annex, this legislation is not targeted specifically at that use,” she said to a light sprinkling of laughter from the audience, which included more than a dozen Occupy Boise supporters. Luna said the bill would allow rules like requiring pets to be leashed. It also would allow the state to issue permits for use of the grounds. The director would have the authority to sue to halt any violation or threatened violation of the rules. The Legislature earlier passed emergency legislation to ban overnight camping on the Capitol Mall; a federal judge blocked parts of it, ruling that the Occupy encampment’s tents are protected, symbolic free speech. Most House members’ office areas remain locked by order of House Speaker Lawerence Denney; he issued the order early this session out of concern for security as lawmakers sought to oust the occupiers. Kay Marquart told the lawmakers, “I really really think that your time could be spent on much more important issues. Many of you have become an embarrassment to the citizens of Idaho that you have not tackled the real issues.” Committee Chairman Tom Loertscher, R-Iona, gaveled her at that point; Marquart said she was done. The rules bill now moves to the full House. Published: March 26, 2012, 12:44 p.m.